Jensen Global JGD500T Digital Programmable Shot Meter is touchscreen digital fluid dispenser allows for reproducible deposits of a wide range of thin or viscous materials such as solder pastes, masks, adhesives, epoxies, RTV's, silicones, cyanoacrylates, paints, inks, oils, lubricants, solvents and more. It is excellent for use with pre-filled syringes of material or when loading empty syringes. 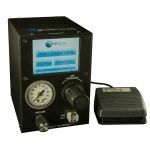 Purchase Jensen Global JGD500T Digital Programmable Shot Meter Today!